Following Dunph’s debut score at Penn National, the Temple City colt cruised to a 7 ¾-length win in the $300,000 Spendthrift Juvenile Stallion Stakes at Churchill Downs on Oct. 28. The Kentucky Jockey Club is the centerpiece of Stars of Tomorrow II on Nov. 24 at Churchill Downs – a day that features 12 2-year-old races that has launched the careers of many Grade I winners and champions including 2017 Horse of the Year Gun Runner, 2010 Kentucky Derby winner Super Saver and 2012 Clark Handicap hero Shackleford. The 1 1/16-mile race awards points to the Top 4 finishers on a 10-4-2-1 scale for the 2019 Kentucky Derby presented by Woodford Reserve (GI) on Saturday, May 4. The probable entrants, according to Assistant Racing Secretary and Stakes Coordinator Dan Bork: Blue Steel (trainer Dale Romans); Current (Todd Pletcher); Dunph (Maker); Kentucky Allstar (Maker); King for a Day (Todd Pletcher); Manny Wah (Wayne Catalano); Mick’s Star (Tom Amoss); Plus Que Parfait (Brendan Walsh); Roiland (Amoss); Royal Urn (Michelle Nihei); Signalman (Kenny McPeek); and Synthesis (Keith Desormeaux). SEEKING THE SOUL WORKS HALF-MILE IN :48.80 IN PREPARATION FOR CLARK DEFENSE – Charles Fipke’s 2017 Clark Handicap presented by Norton Healthcare (Grade I) winner Seeking the Soul completed his final major preparation to defend his title in the 1 1/8-mile race with a half-mile breeze in :48.80 Saturday morning at Churchill Downs. Seeking the Soul began his 2018 campaign with a lackluster fifth-place finish in the $16 million Pegasus World Cup (GI) at Gulfstream Park. Following that race, Stewart gave the 5-year-old a break to heal a minor ankle injury but he resurfaced at Indiana Grand on July 14 with a runner-up finish in the $100,000 Schaffer Memorial. Most recently, the Kentucky-bred finished second in the Breeders’ Cup Dirt Mile (GI) at Churchill Downs. Jockey John Velazquez, who was aboard Seeking the Soul for his half-length win in the Clark, will have the riding assignment again this year, according to Stewart. The Clark Handicap, run at 1 1/8 miles, is expected to include Believe in Royalty (Larry Jones); Bravazo (D. Wayne Lukas); Hawaakom (Wes Hawley); Hence (Steve Asmussen); Leofric (Brad Cox); Seeking the Soul (Stewart); Sightforsoreeyes (Anthony Quartarolo); and Storm Advisory (Quartarolo). Also breezing Saturday morning at Churchill Downs in preparation for the Clark were Loooch Racing’s allowance winners Sightforsoreeyes and Storm Advisory. Pennsylvania-bred Storm Advisory was the first to work at 8 a.m. and recorded a half-mile in :47, the fastest of 33 recorded at the distance. In the next set, former $35,000 claimer Sightforsoreeyes worked the second-fastest half-mile of the morning in :47.60. Entries for the Clark Handicap will be drawn Sunday. The $500,000 Clark Handicap presented by Norton Healthcare (GI) – for 3-year-olds and up run at 1 1/8 miles: Believe in Royalty (Larry Jones); Bravazo (D. Wayne Lukas); Hawaakom (Wes Hawley); Hence (Steve Asmussen); Leofric (Brad Cox); Seeking the Soul (Dallas Stewart); Sightforsoreeyes (Anthony Quartarolo); Storm Advisory (Quartarolo). The $200,000 Mrs. Revere (GII) – for 3-year-old fillies run at 1 1/16 miles on turf: Angel of Mischief (Norm Casse); Cool Beans (Brad Cox); Dark Artist (Jane Cibelli); Get Explicit (Barbara Minshall); High Tech (Ian Wilkes); Kabella (Danny Peitz); Over Thinking (Vicki Oliver); Stella Di Camelot (Chad Brown). The $200,000 Kentucky Jockey Club (GII) – for 2-year-olds run at 1 1/16 miles: Blue Steel (Dale Romans); Current (Todd Pletcher); Dunph (Mike Maker); Kentucky Allstar (Maker); King for a Day (Todd Pletcher); Manny Wah (Wayne Catalano); Mick’s Star (Tom Amoss); Plus Que Parfait (Brendan Walsh); Roiland (Amoss); Royal Urn (Michelle Nihei); Signalman (Kenny McPeek); Synthesis (Keith Desormeaux). The $200,000 Golden Rod (GII) – for 2-year-old fillies run at 1 1/16 miles: Champagne Anyone (Ian Wilkes); Gold Credit (Ignacio Correas); High Regard (Vicki Oliver); Liora (Wayne Catalano); Meadow Dance (Brad Cox); Princess Causeway (Wilkes); Reflect (Keith Desormeaux); Restless Rider (Kenny McPeek). DOWN THE STRETCH – Racing continued Saturday with a first post of 1 p.m. (all times Eastern). There is a massive $162,434 carryover in the 20-cent Single 6 Jackpot which gets underway in Race 6 at 3:36 p.m. and a Late Pick 5 carryover in Races 7-11 of $53,419. 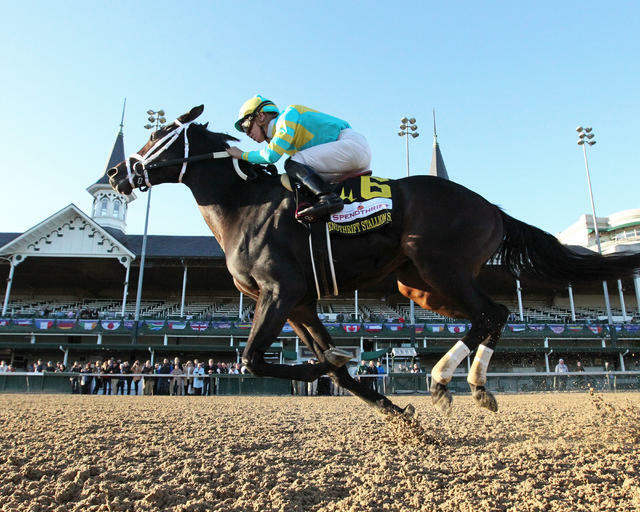 … The first of four Kentucky Derby Future Wagers will get underway Thursday-Sunday along with the Kentucky Derby Sire Future Wager. The fields will be announced Monday. For more information, visit: https://bit.ly/2j6m0qy.